On October 28th, I was scared. I was well and truly scared. I was deadlifting (for those serious CrossFitters, I was doing 16.4/17.4) in a workout that starts with 55 deadlifts. I thought I was so warmed up, so prepared. I had done this workout before and I knew exactly what I was getting into. While setting the bar down on my 43rd rep I felt some of the most intense pain I had ever felt, and it was in my lower back. I was petrified. I was in tears trying to get off of the floor (luckily I had a great crew there to help me). I couldn’t stand up straight, when I thought I had to sneeze I would be on the edge of a panic attack because of the pain, and I definitely couldn’t put on pants or shoes by myself for about 2 weeks. It was so demoralizing to go from being active, feeling strong, and being totally self-sufficient to needing my husbands help to get up from the toilet. Turns out that bulged discs in your back are no joke. Of course I had a ton of thoughts racing through my mind about how bad it was, when I would be back in the gym, but I was so anxious about what other people thought. And if I had a dollar for everytime someone told me it was because of CrossFit and how I should stop, how it isn’t healthy and safe to be lifting those weights like that, then I would be a very rich woman. I was not stopping. I turned to Dr. Jonathan Burke, a doctor of physical therapy at Therapydia NOLA. Jonathan is also a friend and fellow coach at CrossFit Roux and is the biggest reason I am not only back at it, but I am a stronger and smarter athlete than I was 7 months ago. So I sat down with him to get a little bit of his background and to find out why he chose CrossFit, and what he would say to all of those naysayers out there. Were you active growing up? What did you do? I played football, baseball, and basketball for the city Kenner, also known as America’s city. And then in high school I played Football and baseball for Jesuit. How did you get into Physical Therapy? As a sophomore in high school I fractured an ankle during a baseball practice, it took some physical therapy sessions to get me back on the baseball field and I was intrigued by the profession. Then through football and weight training, I progressively got more intrigued with the body and how it moves and how it works. I coupled that with my love for helping people, which became evident when I did the Camp Sunshine muscular dystrophy camp. I was a camp counselor for a young man with muscular dystrophy for a week and it was an awesome experience. So I started to wonder, “What can I do to help people, but also continue to learn about the body and put that to good use?’ Physical Therapy is where I landed and I haven’t regretted it since. How did you get into CrossFit? Why did you pick CF over other sports or gyms? For a long time, starting in high school, I did conventional weightlifting and bodybuilding, that you see at most of your normal gyms and I just got burnt out. I would go after work and just not want to be there. I had no accountability, I wasn’t in a class, I was working out by myself. Then a buddy of mine got me to try CrossFit. It was on a Saturday and the first workout was for someone’s birthday. It was a “Filthy Fifty” format, but with 35 reps of everything and I got smoked. Not beat, but SMOKED by everybody in the class. I was the last one there and people were cheering me on, which was a great experience but very humbling at the same time. I signed up that day and have not stopped since. 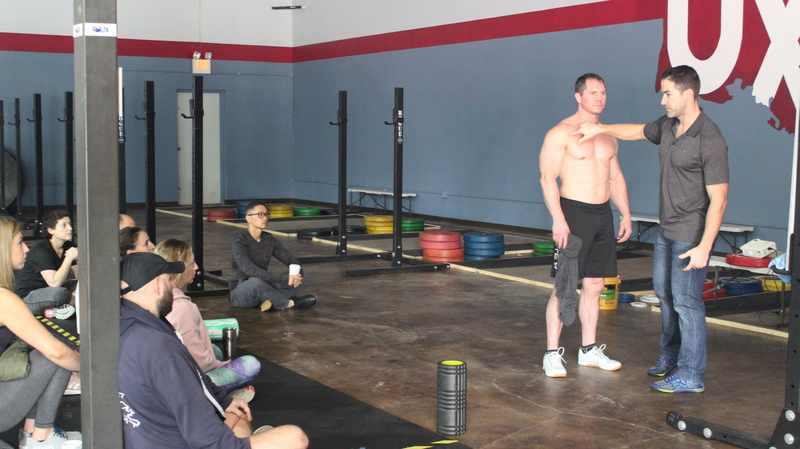 Do you find that coaching and being CrossFit athlete yourself are at odds with being a PT? I actually think differently. I actually think that being a coach has helped me look at global movement patterns and see patterns that show up a lot. 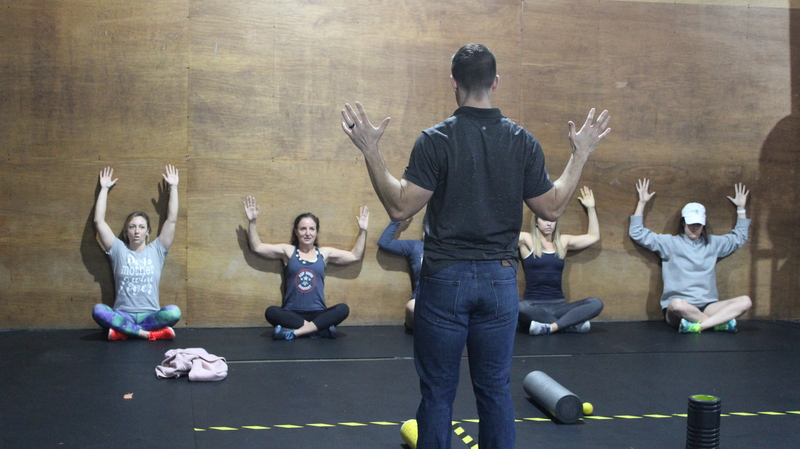 By being a PT I am able to help and guide those movement patterns to help them become better. To increase performance to help reduce the risk of injury. It goes hand in hand and both have been beneficial for me. I think being a CrossFit coach has made me a better PT and being a PT has also made me a better CrossFit Coach. I’m sure you hear “everyone that does CF gets injured” all the time. What do you say to those people? I know people that get injured playing adult kickball. That get injured playing rec league soccer, basketball, softball. I know people that has significant injuries from conventional weightlifting. But that is not sole to CrossFit, that is just exercise in general. 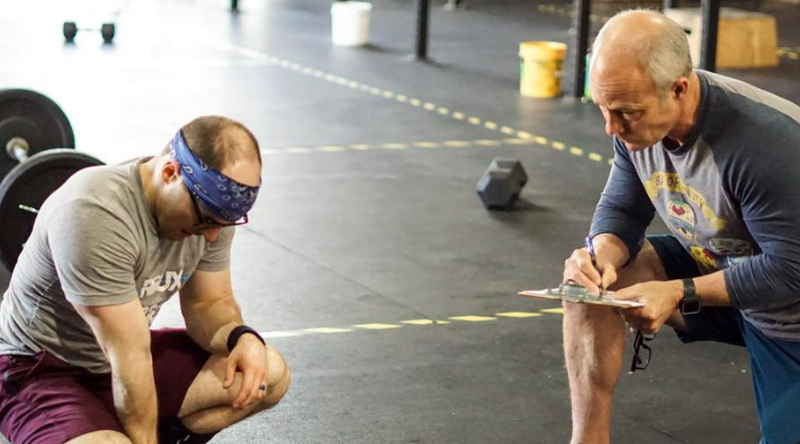 Do injuries happen in CrossFit? Absolutely, I am not saying they don’t. But I don’t know the research that says they happen more in CrossFit than they do in any other sporting activity. What is the most common injury you see from CF? Any advice to avoid it? I see a lot of cranky backs, shoulders, and knees due to CrossFit related injuries. But now we are starting to see that a lot of those are linked to acute spikes in training volume. For example; people are getting ready for the Open. They do not have butterfly pull-ups yet but they know that a lot of pull ups are coming and these are the fastest way to get them done. So they suddenly start practicing a movement that they aren’t familiar with and don’t do often 3 or 4 days a week. Or they are new to CrossFit and started coming 3 days a week, but they bought in and love it and suddenly start coming 5 days a week. Those are common, acute spikes in training volume. And I see that when people are getting ready for any kind of competition. People start to train more than they usually do; increases in number of times at the gym or weight and intensity. All of these play a large part in injury. I think smart programming helps. As does listening to your body, if there is a certain movement that is painful that can not be made pain free by a coach altering your position, that’s something you might want to get looked at. Don’t just try to hammer through it and hope it goes away because it usually won’t go away. It will progressively build and build to where you HAVE to get it checked out. Now you are modifying multiple movements in the gym. What advice would you give an injured athlete? I think the biggest thing is listening to your body and never trying to push through the pain. Pain is a protective mechanism and it’s there for a reason. When you are injured or having pain with a certain movement, sometimes you may just need to step back, not go as heavy. Change it up. Say you have a sensitive knee and squatting hurts your knee, there are other things you can do. Like a deadlift, which is more of a hinge pattern or a box squat where your knees don’t come over your toes. You can try a reverse lunge. But we want to let that sensitive area calm down a little bit. The goal is never to take the athlete out of the gym but sometime we have to modify things to keep us there, to keep us training, to get past some of these hiccups and become the best version of ourselves. A big piece of advice I can give to an injured athlete returning back to CrossFit, because I see it all the time with athletes that have been out of the gym for 4-6 weeks and finally have the green light to go back, is that there’s a big gap between having no pain walking and during daily activities and being pain-free at CrossFit. You have to steadily ramp back up. I help a lot of athletes return after injuries and we have to make sure that progression is gradual and that it isn’t just a straight , vertical spike.